Microsoft showed its first public demo of Windows 8 on Wednesday, and it's not at all like the Windows operating systems you've come to know over the past 25 years. The next version of Microsoft's operating system ("Windows 8" is just a codename) is a radical departure, designed around touch screens. What Windows 8 features did Microsoft demonstrate? Essentially, Microsoft showed how Windows 8 will work on both tablets and traditional PCs. The operating system's home screen is filled with big, touchable panels, like the live tiles in Windows Phone 7, and from there you can tap and swipe your way to other touch-based applications. But underneath that touchy layer is plain old Windows, with a task bar, file manager, app icons--everything. How does the touch interface work? 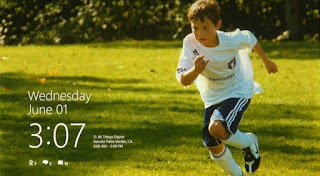 From the start menu, which shows basic information like time and unread e-mail counts, users swipe upwards to reveal the home screen and its tiles. As with Windows Phone 7, apps can show some information within the tiles--users needn't click on the weather app to see the current temperature, for example. Swiping from the right bezel brings up a menu that can take users from an app back to the home screen. Users can multitask between open apps by swiping across from the left bezel. And therein lies the coolest-looking feature of Windows 8: When swiping in a new app, users can snap it in place next to the app that's currently running. This allows users to view two apps at the same time--something that no existing tablet OS can do. 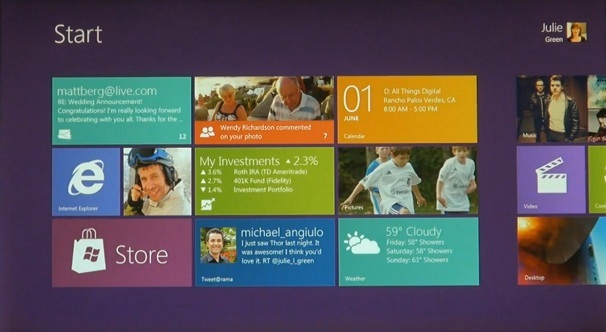 How will Windows 8 apps work? What about existing Windows apps, such as Office and Photoshop? But what about Windows PCs running on ARM chips? Will legacy apps run on those devices? It's conceivable that ARM-based Windows devices will be restricted to the touch-centric user interface in Windows 8, but Microsoft hasn't made any announcements on that front. In fact, Microsoft recently denied claims made by an Intel executive about which apps will run on ARM-based Windows machines. Intel's Renee James had said to expect at least four versions of Windows for ARM processors, and that none of these versions would be compatible with apps from Windows XP, Vista or 7. Microsoft said these statements were "factually inaccurate and unfortunately misleading," but didn't clarify the matter with any details. In other words, the question is still unanswered. When's the Windows 8 release date?